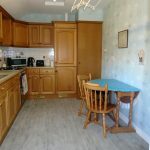 Large bright rooms, two double bedrooms all with excellent storage. 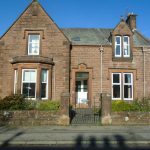 This attractive sandstone property offers spacious accommodation with two large public rooms , two double bedrooms, shower room and dining kitchen. 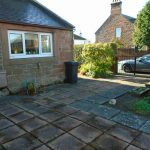 Although a ground floor flat the property has its own private front and rear access doors with front and back gardens and a garage providing off street parking or additional storage. 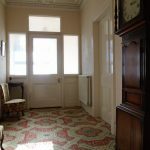 Entrance is by way of a hardwood door which leads into the tiled vestibule. This has a tiled floor and door with decorative upper and side glazed panels leading into the – Hallway. 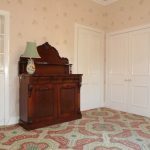 As the centre point of the property the hall is light and roomy with traditional detailed decorative cornicing. Off the hall lies the Lounge and the rest of the accommodation. 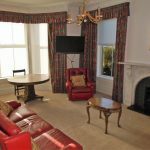 The large bright Lounge has a feature fireplace with a marble surround, tiled back panel and hearth . This houses a coal effect gas fire. A recessed alcove is shelved providing storage. 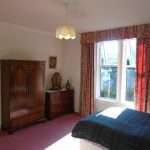 The other major feature of this room is the large bay window which allows light to flood the room along with a further window to the side. Again this room has detailed period cornicing and ceiling rose. 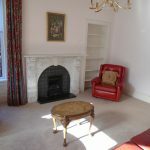 The dining room lies to the rear of the property is again a spacious room with a shelved alcove with cupboards below. Two large cupboards with lighting and power provide storage and one houses the electricity meter. 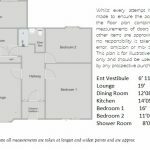 This room could be used for formal dining or as a second social space depending on the purchasers needs. This leads through to the kitchen. A good run of wall and base units with ample worktop preparation space. Stainless steel sink with mixer tap and side drainer. 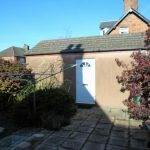 There is space and plumbing for a washing machine, which is housed in one of the base units, this is included in the sale along with the fridge freezer which is also housed in a larder style cupboard. There is also an integratedelectric double oven and gas hob. The kitchen has ample space for informal family dining. 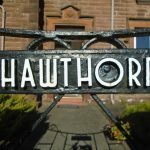 Returning to the hall and the shower room and bedrooms are located here. 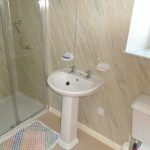 The shower room comprises of a shower cubicle with thermostatic shower and hand rails, pedestal sink and w.c multi- surface wall coverings. 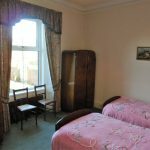 The two double bedrooms are both spacious and bright with large windows and the larger of the two has a built in cupboard. 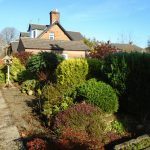 The small roadside front garden has a mixture of mature shrubs and a path leading to the rear garden. This is mostly paved with an outside light and tap. There is a rotary drier and double access gate ,which could allow vehicle access. 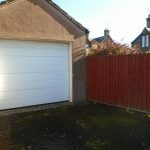 The large garage, with electric door, is at the bottom of the garden and has an access door from the garden but vehicle access is from a from the neighbouring street.